The Crazy Bookworm: Six Months Later by Natalie Richards: A Review and Featurette! 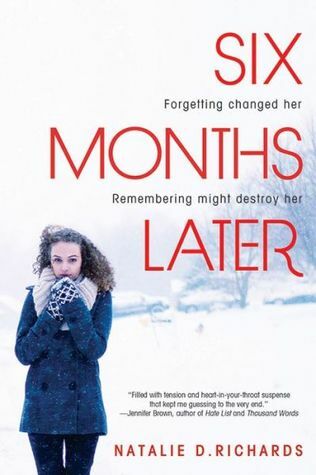 Six Months Later by Natalie Richards: A Review and Featurette! Chloe didn't think about it much when she nodded off in study hall on that sleepy summer day. But when she wakes up, snow is on the ground and she can't remember the last six months of her life. Before, she'd been a mediocre student. Now, she's on track for valedictorian and being recruited by Ivy League schools. Before, she never had a chance with super jock Blake. Now he's her boyfriend. Before, she and Maggie were inseparable. Now her best friend won't speak to her. And why can't she remember? Read more 5 Star Reviews on Amazon here and GET YOUR COPY TODAY! Natalie D. Richards won her first writing competition in the second grade with her short story about Barbara Frances Bizzlefishes (who wouldn't dare do the dishes.) Now she writes about awesome girls, broody boys, and all things dark and creepy. When she's not writing or shopping her manuscripts, you can probably find her wading through the towers of dog-eared paperbacks that have taken over her bedroom. Natalie lives in Ohio (Go Bucks!) with her techno-wiz husband, three amazing kids, and a seventy pound dust-mop who swears he's the family dog. If I had to describe Six Months Later in only a few words, I would say: Compelling, thrilling and quite the page-turner! This novel left me on the edge of my seat the entire way though! I was an immediate fan of Chloe. I found it really easy to fall into step with her because she reminded me a lot of myself when I was in High School(although I didn't have a totally swoon-worthy "Bad Boy" pining after me!) She was a well crafted Character and remained a powerful one throughout the novel. Adam stole the show for me! Natalie did such a fantastic job at making this Breakfast Club type bad boy a favourite of mine! Long hair, piercing eyes; More please! Very swoon-worthy and aside from that, he was a wicked character. He added a lot to the plot and was much more than just a secondary character. The plot line of this novel is quite nerve-wracking! I mean, imagine dozing off, and waking up with a six month gap missing. CAA-RAAZZY! You will be flying through the pages to fill this gap along side Chloe! A superbly crafted story! A mysterious reading experience sprinkled with a tad of romance made this novel a winner! This will definitely be one that I blab on and on about with my friends in the years to come! And one that I will definitely be re-reading to visit these great characters again! I'm really excited to check this one out. It sounds intriguing and I really want to know more about this mystery.. how does someone fall asleep to lose six months of their life?!?! And the fact that everyone seems to be loving this makes me that much more excited! Bender is exactly who came to mind when reading Adam!! Plus, The Breakfast Club is just about the greatest movie. Ever!